Why do we still measure RF? Serology is important for RA classification and supports clinical diagnosis. 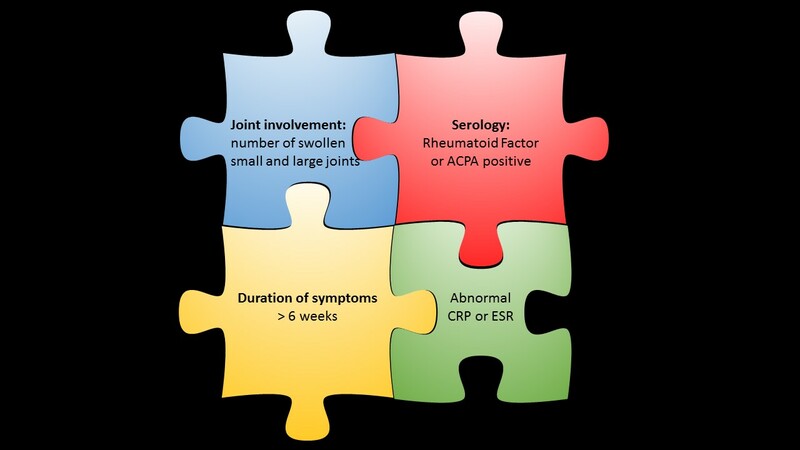 According to the 2010 criteria ACPA and RF analysis represent a major jigsaw piece for RA classification. The criteria define a scoring system attributed to the relative weight of the following parameters: joint involvement, serology, acute-phase reactants and symptom duration. A final score of six out of a maximum score of ten classifies RA . ACPA and RF are considered as equivalent diagnostic markers; low titers of either ACPA or RF add two, high titers three points to the total score, – that is already half of the required six points for definite RA classification. More than 70 years after its invention RF is still regarded as a valuable diagnostic marker for RA. Researchers are now addressing the challenging question whether RF and other autoantibodies in RA are only an epiphenomenon or real pathophysiological effectors that may interact synergistically to drive disease development. Jeremy Sokolove and his coworkers investigated the interaction of ACPA and RF, and its association with disease activity and inflammation . They analyzed sera of 1488 US veterans with RA and compared measures of disease activity and serum levels of cytokines in ACPA+/RF+, ACPA+/RF-, ACPA-/RF+ and ACPA-/RF- individuals. In addition, they stimulated macrophages with ACPA immune complexes in the presence or absence of IgM-RF, and analyzed the production of tumor necrosis factor alpha (TNF-alpha) as an indicator for macrophage activation. Compared to the double negative subgroup, as well as to each single negative subgroup, the double positive subgroup of patients had higher disease activity and higher levels of C-reactive protein and inflammatory cytokines. In vitro stimulation of macrophages with ACPA immune complexes increased cytokine synthesis in these cells. Addition of RF in the stimulation experiments further enhanced TNF-alpha production. Taken together, these data suggest that ACPAs and IgM-RF act together in the pathogenic process of RA and induce cytokine production in macrophages. IgM-RF may boost the effect of ACPA immune complexes, indicating a mechanistic link by which RF enhances the pathogenicity of ACPA in RA. As a licensed medical practitioner, and a graduate of the Yale School of medicine, Dr. Kokayi is a holistic and homeopathic doctor who works to pinpoint a core belief or dysfunction that is getting in the way of complete healing.